(NaturalNews) He certainly isn't the only president in U.S. history to run trillion-dollar deficits, but he is the first to run as many in a row. It's official now: Barack Obama is head of the most profligate spending government ever. In a recent disclosure of updated historical budget data for the federal government, the Congressional Budget Office reported a deficit of $1.087 trillion for fiscal year 2012, marking the fourth straight year - and the only four-year stretch in history - that federal spending was more than a trillion dollars over what the government received in revenue. Last year's $1.087 trillion deficit was even greater in inflation-adjusted dollars than the peak World War II deficit of fiscal 1943 - which was $54.554 billion in 1943 dollars and $723.8714 billion in 2012 dollars, according to the Bureau of Labor Statistics online inflation calculator. In addition, the deficit remained at a higher percentage of gross domestic product (GDP) over the course of Obama's first term than at any time since the end of the Second World War (which ended in fiscal year 1946 and which began in June 1945; the war officially ended with Japan's surrender Sept. 2, 1945). In February, CBO had first reported that the deficit for fiscal 2012 - which ended Sept. 30 of that year - was $1.0894 trillion. That figure was based on an estimation that the federal government had received in revenue $2.4491 trillion and had spent $3.5385 trillion. But, in May, the agency revised its figures, raising its deficit figure for the year. Before Obama, George W. Bush was the most profligate spender. In fiscal year 2008, the last full year he was in office, the federal deficit was $458.6 billion, according to CBO figures. During his 8-year tenure he added $4 trillion to the national debt. But "[a]s a percentage of GDP, the deficits for fiscal years 2009-2012 were greater than the federal deficits in any year since World War II," CNSNews.com reported. Obama, by comparison, has added more to the debt ($6 trillion) in less time than Bush. And debt is going to destroy the country. 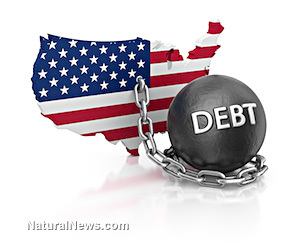 According to a number of economists and budget experts, what is driving most U.S. government debt are entitlements - promises of benefits to various constituency groups made by successive congresses for years, for the dual purpose of buying votes and making more of us dependent on government for our survival. That's why there is never any serious discussion of entitlement reform, because the hierarchy of both major parties likes the thought of having you come to them for all your basic needs. It's a power trip that will destroy our country. "From an economic perspective, the size of the deficit and debt per se are not necessarily as important as the underlying policies of spending and taxation," Michael Pakko, an economist at the Federal Reserve Bank of St. Louis, wrote in 2009. "Nevertheless, when [budget] deficits are part of a fundamental structural imbalance in the long term, they signal a need for serious attention and reform. In a long-run fiscal analysis of U.S. federal government programs, this is demonstrably the case." The "structural imbalance" he talks about is the number and cost of entitlement programs. Worse, this is a cost that is rarely discussed in any serious budget debate. The only dollar figure you're going to hear about in the coming weeks when Congress once again takes up the subject of raising the federal budget debt ceiling is the national debt, seen here. But take another look at the U.S. Debt Clock. Look at the bottom of the graphic. You'll see a category marked "US Unfunded Liabilities." This is where the real disaster looms. While the "national debt," as of this writing, is about $16.9 trillion, the real debt figure is listed in the US Unfunded Liabilities - entitlements - category, and it is a staggering $125.3 trillion. I dare say there isn't enough money in the universe to pay that off. So while Obama and Congress fight over scraps - a billion dollars here, ten billion there - a hundred years' worth of bad policymaking and over-promising of benefits for the sake of retaining power has left our country just about as broke as it could ever possibly be.